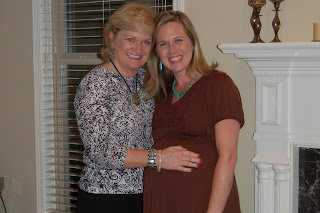 Saturday night some sweet family & friends gathered to give us a little shower to celebrate our coming baby boy. We enjoyed yummy lasagna & bread, a great salad, mint tea and delicious berry bread pudding for dessert. It was a great "girls night" of chatting and catching up, talking babies to come, babies here, & babies past, and enjoying each other's company. We got some great presents for little Lincoln, and I was excited at how cute boy clothes can also be after a year & a half of enjoying dresses & bows! 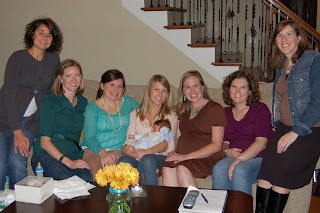 I feel truly blessed to have such a great group of women celebrate baby boy, and am thankful to them for their support and love! Thanks especially to Laura, Jenn & Sandy for putting the shower together!! Grammie shares a hug with Lincoln & me! I love all the pictures from your weekend, especially the one of GA on the tractor! 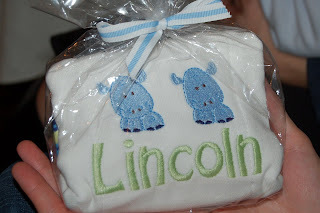 The shower was a lot of fun, and you got some great stuff for Lincoln. I can't wait for him and Logan to be best buddies! Good thing we have Georgia to keep them in line! As I mentioned online yesterday, you look WONDERFUL! I LOVE all of your blog posts!! THANK YOU!!! :) I've missed you in the blogging world, girl! You've got to get in as much as you can now b/c you'll REALLY be busy SOON! :) YAY!!! What a great shower! Don't we have some amazing girlfriends!?!?!? Oh, and it was SO good to see your mom! Give her a big HUG from me again, please! You look GREAT Kathryn! Looking forward to meeting Lincoln soon! love you.